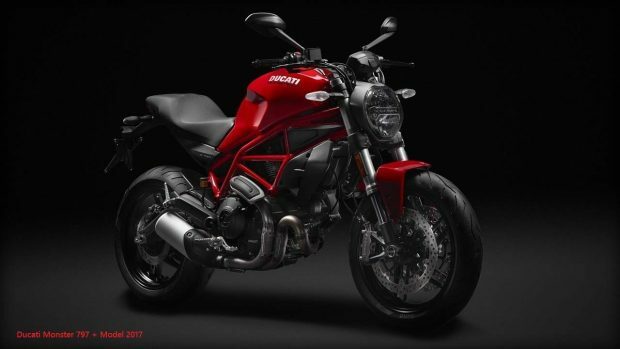 The new Ducati Monster 797 is the ideal bike for those who wish to join the Ducati road world. Sports and minimalist as any Monster, is easy to drive and offers everything you need for a fun ride and at the same time simple and intuitive. Its versatility is also the new Monster 797 the ideal bike for everyday use. 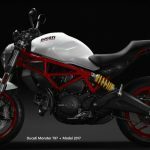 The Monster 797 is available in three colors: white of the star of silk, with them wheels of the frame and red, the classic red Ducati, with the frame and the wheels black and the elegant stealth dark with them wheels of the frame and black, also in Plus version, equipped with a windshield and a cover of seat for the passenger. 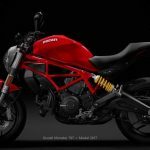 In 2017 Ducati seeks to record sales of models such as Ducati Monster 797, the new Monster access unprecedented volume. 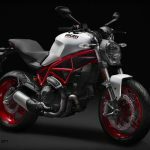 To further strengthen the range of this monster, firm Borgo Panigale will also offer Ducati Monster 797 +, better equipped if you use the bike only. 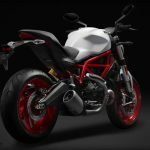 The price of the Ducati Monster 797 + is 9,390 euros, 400 more than the standard version. It can be purchased in White Star Silk, Ducati red and black colors stealth. Two additional details which receives the bike, the first in a dome on the lighthousewhich improves the aerodynamics of the motorcycle and the second cover for the passenger seat, the two elements of the same color as the front fender and 16.5 litrestank. There‘s two elements that contribute to improve the visual appearance of the bike. Double engine air-cooled 803 cc 75 ch and 69 Nm of torque at 5750 rounds. Seat 805 mm above the ground. Brakes Brembo with radial monoblock M4 3.2. Halogen front optical, no LED. USB plug under the seat.